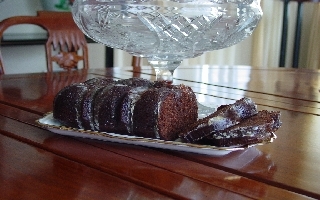 Lebkuchen is a thick cake-like cookie, square bar, or loaf cake. The cookies are one of the most popular in Germany, and have been made for centuries. Lebkuchen is eaten all year round, but is very special at Christmastime, along with the famous German Christmas Stollen. "This is a recipe that I got from my friend Agata who is an excellent cook and loves baking.......Angela"
1/2 cup marmalade - a tart marmalade is best used in this recipe. Preheat oven to 325F. Grease a 12X4* (loaf pan), or a 9X13** inch baking pan, or a 9X5** inch loaf pan. Mix together: flour, baking soda, cinnamon , and cocoa. Add eggs, sugar, oil,vanilla extract, marmalade, milk, and mix together well. Pour batter into greased pan. Bake at 325F for 40 minutes, then turn the oven temperature up to 375F, and bake another 15-20 minutes, or until a toothpick inserted in center comes out clean. Remove to cooling rack and let cool completely, about an hour, then turn cake out onto a serving plate. If desired, ice cake with flavor of your choice while cake is still warm. Mix confectioners sugar with lemon juice, and add warm water a little at a time, until consistency is to your liking. Drizzle icing over warm cake. *NOTE: You can purchase a 12X4 inch loaf pan at Cooking.com, made by Nordic Ware. It is called a Fancy Bundt Cake Loaf Pan. Just click on the Cooking.com banner on any of this website's pages if you would like to purchase this pan from them. **NOTE: A 9X13 inch pan can also be used to make the Lebkuchen, or one 9X5 inch loaf pan. If made in a 9X5 inch loaf pan, the cake will be smaller and higher. If made in a 9x13 inch pan, the cake will be less deep and should be cut into squares.